Mood: I’m good.. just really, really hot. So, it’s been a week since my nightly visit. I haven’t turned into a vampire yet, not have I turned into Spiderman..since I was bitten by one a few years ago… A spider.. not Spiderman… But I wasn’t bitten by a bat either. I also read in the news that I’m not the only one having visitors. 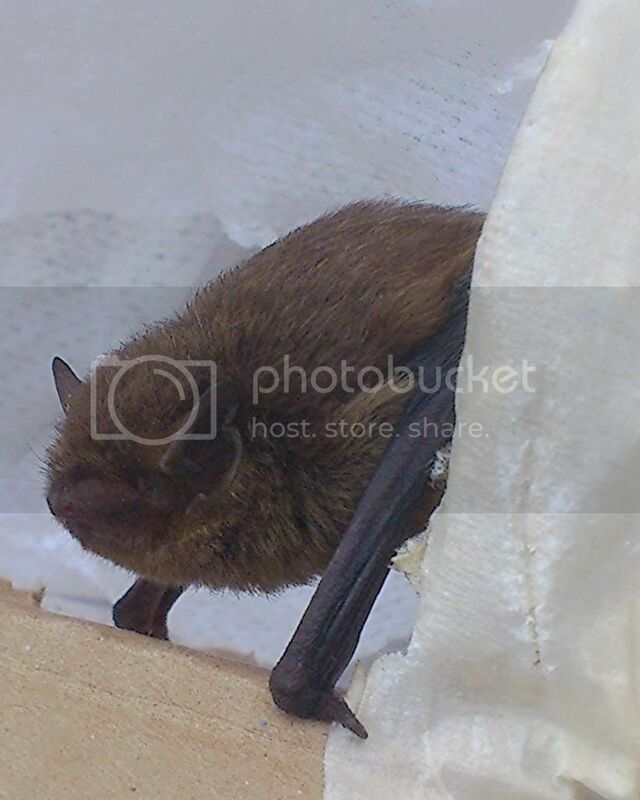 In the middle of Norway someone heard calls from the attic, went up and found a bat in a plastic bag. It looked totally different from the one I found. It had a lot less hair than mine.. and it wasn’t as cute. It also said in the article that it was no big deal to have bats in the house, that whatever droppings there were could be vacuumed away or brushed up. I can’t even find anything about people getting infections of the airways from bat droppings in Norway. I know some people would worry about that. I guess the most important part is to let the authorities know.. or the Norwegian Zoology people. They did end up calling me.. but I had already let the wee one go. I think I’ll make a bat hotel, just to keep the away from the house. I’ll have Jan help me. Other than that no new news. Except for Prince William and the Duchess of Cambridge Kate Middleton had a baby boy yesterday. Congratulations! Be utterly excellent to each other! Mood: Tired and my throat is out… well, my voice doesn’t work too well. and opened the window. The carpet puncher was for my sake, to wave in front of me so that they wouldn’t fly up in my face and freak me out, hurting them. And I waited. They did not seem to want to leave. They landed on the curtains and everything, but nope, didn’t want to fly out. About 30-40 min later I started hearing creepy noised from the attic and all of a sudden I saw a bat-wing stick out from a tiny hole between the attic ladder thingy and the ceiling. The poor thing thudded to the ground, unable to do more than scamper to safety, in a hole in the wall, where wires from the kitchen comes out. I told it it couldn’t stay there and eventually it started to try and fly. Poor thing couldn’t get off the ground. So it scampered into the other room and I could hear it flutter about in there. Meanwhile the mother was on the curtains calling it, walking back and forth. I’m guessing 20 min after that the baby was on the wing and flew into my stepdaughters bedroom. The mother was crawling down the curtain and jumped out the window. I have NO idea where the other grown up was. I have no idea if it flew out or if it’s still in my stepdaughters bedroom, cause that’s where it flew in. But they did that.. they flew in there and I waited for them to come out and then suddenly they came our from our bedroom area which is not connected to her bedroom. I’ll check it later. If it’s there I’ll just open the window and let it out tonight. About 20 min later the baby started moving and then it flew out the window. I quickly closed the window, closed the door into the other bedroom and went to bed. I really hope it was a one time thing. If all else fails I’ll make them a bat-box. Needless to say that I was too jacked to sleep. I slept for one hour and got up around 6am. I slept on the couch, but it wasn’t a good sleep. Not the kind I need. So work today will be fun, but it’s only for 5 hours.